Canyon Lake Vacation Rental #13574 LakeHouseVacations.com Rent Me! RRC 305 22 located right on the Comal River! 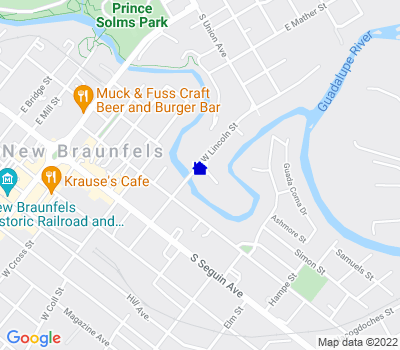 Walk to downtown New Braunfels! 2 bedroom, 2 bath condo at Inverness Condominiums that is next door to Schlitterbahn and on the Comal River. Beautiful large deck, a pool overlooking the river and direct river access!! It has hardwood floors, a new 43" flat screen smart TV, internet, and everything you need for that vacation get-a-way. The dining table seats six. Newly painted and new bedding in both rooms.There is one Queen bed, one brand new King bed, and a brand new sofa sleeper. High quality linens are provided for beds and bathrooms. The condo has dedicated parking and a beautiful pool right on the River. It has a large wood deck with tables and chairs and a long grassy waterfront with grills and picnic tables. River access as well. You are sure to have a great time! You are provided 2 parking passes, one for a numbered covered spot and a second for general parking. This condo is on the third floor and does have an elevator. Guests must be 25 years of age or older to make a reservation and must be staying at the property. No pets allowed. You will receive 6 wristbands (max amount allowed). This condo has a maximum occupancy of 6 guests. This maximum occupancy is not to be exceeded at any time. No daytime guests allowed. Nice condo overlooking the river. Lots of room to roam around especially for our two year old. The whole process was very easy from booking to checking in. " The condo was lovely and in a great location to the river and to the town square. My only comment would be that the extra fees added to the cost were more than 50% of the nightly rental fee. My cost went from $160 a night for 2 nights to $260 a night for 2 nights. " This condo was awesome! Two bedrooms were spacious and clean. The bathrooms and kitchen were fully stocked. It was a perfect place for a girls’ getaway!" I have stayed in several units. This one was a bit disappointing, very old, original fixtures." It was good but the place needs some care . The pool needs to be heated and the hot tubs need to be taken off the add." This is a great place if you want to really dive into the different water attractions in New Braunfels. It's a 2-3 hour float from the Camal park entrance up to your private condo exit. Then Schlitterbahn is only a 3 minute walk to the park. Will definitely be coming back. " Last minute trip to New Braunfels for two couple just wanting to relax. Thankful to stay at the condo, visit Market Day and local restaurants." The property was a bit dated but nice and clean and had everything we needed. Where you can get into the river is close to the exit so we floated to the exit and walked back to the property a few times"
We absolutely loved it!! Will definitely be staying here again!!" Jul 05, 2017 - Tammy W.
The condo was very nice! Well kept and clean! There was a problem with one of the burners on the stove and they didn't have as many pans as I would have liked but besides that everything was perfect! I will definitely book here again! " Recliner was broke. Other than that everything was great." We enjoyed the condo, it was in a great location close to everything. It was clean and comfortable and the staff was helpful if we needed anything. " Great condo and location "
The overall property was a great spot for relaxing and enjoying the river. The condo was nice with comfortable furniture. The only thing missing was some general kitchen supplies that would have been nice, such as a cookie pan or a larger pan for making food for a larger group. Most condos I've been to had at least coffee filters and salt&pepper, but this one had none, and we had to use grocery bags for trash since the room only had 2 trashbags for the whole weekend. Little things like this could have made a big difference. The bathroom soaps were great though! We really enjoyed our overall stay. "